It only took three years and two months but Ipswich Borough Council civil servants have finally got their act together and completed the paving of a 20 metre stretch of dirt track, which is heavily used by residents and shoppers every day. Back in August 2009, when I was an elected Conservative councillor, the Committee I chaired – Community Improvements – approved the spending of funds to finish off what the East of England Cooperative Society should have done when they built there new food store on Foxhall Road back in 2005, paid for out of their Section 106 money. But then the lawyer at Ipswich Borough Council – known for her Labour Party sympathies – got involved and put a spanner in the works. You see the path is in Holywells Ward – a Conservative ward. But of course that had nothing to do with the obfuscation and delay by bureaucrats at Grafton House! It took another 18 months before the Community Improvements decision was taken to the Executive Committee by Borough officers. The Executive duly approved it without even a whimper. Then some strange Local Government law was invoked by the said lawyer, which meant after Executive Committee approval of the Community Improvements Committee decision approval the decision also had to go to the Full Council of 48 councillors for a green light! Even the Soviet Union wasn’t this bureaucratic. Unsurprisingly, a confused Council in March 2011 nodded through the decision already made by two Committees. And then another one and half years passed before the workmen arrived on site. I am told during this time a design for the new path had to be written – 18 months to design how to lay concrete slabs!! 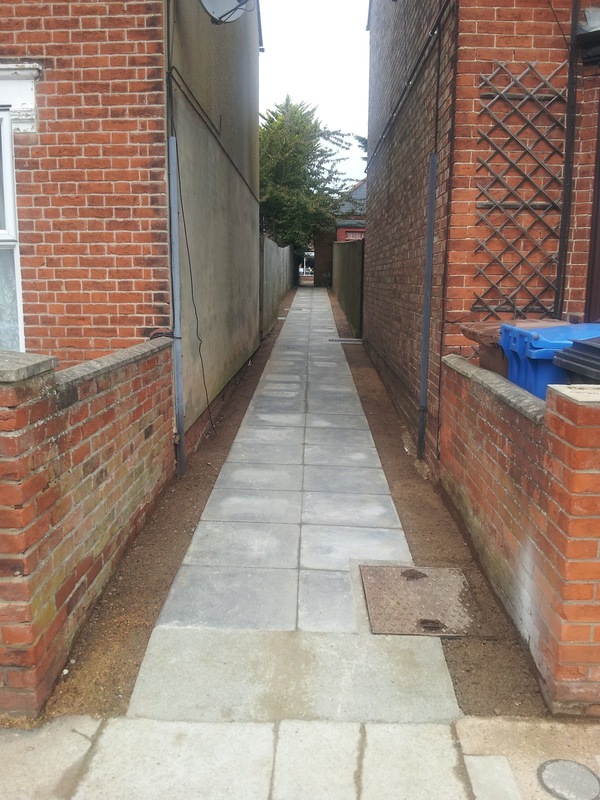 But now the work is done and local residents and shoppers can enjoy walking to the shopping parade on Foxhall Road without worrying unduly about what undesirable items are underfoot. The path is now adopted by Ipswich Borough Council, which means they must clean it and litter pick. Hurrah!! Now, we just need some lighting. Categories: footpath, Gladstone Road, Ipswich Borough Council, Sir Humphrey | Permalink. Breaking News. Hold the front page. Well, it wouldn’t be such a big deal if Ipswich Borough Council hadn’t taken three years and two months to implement a councillor decision. That’s how long ago it was that my Committee agreed to spend what in the grand scheme of things is a tiny amount of money paving the remainder of the heavily used footpath between Gladstone Road and Foxhall Road alongside the Co-op store. 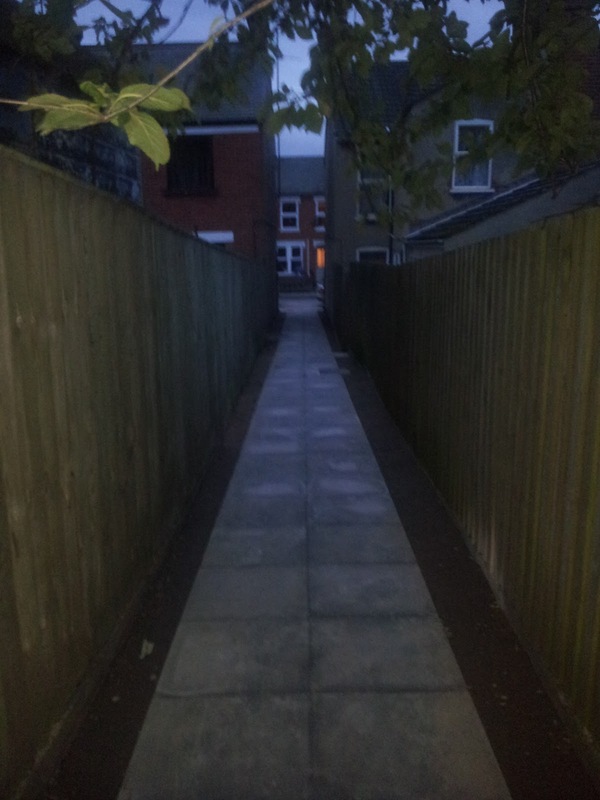 If planners at the Borough had half a brain between them they would have got the Co-op to pay for the WHOLE path and not just the bit alongside their premises out of their Section 106 money when they built their new shop on Foxhall Road back in the boom year of 2005. But I guess civil servants only pretend to care about the public part of public sector when they are trying to cream even more money off the State into their own pockets. So after my Community Improvements Committee approved the paving of this urban dirt track back in August 2009, after the Executive Committee approved it, after all 48 councillors at a full meeting of the Council approved it, after two questions at Full Council, after extensive lobbying by Cllr Liz Harsant and newly elected Cllr Pam Stewart, and of course after my persistent blogging, Ipswich Borough Council’s workmen finally turned up this week to start laying the concrete slabs! Categories: Cllr Liz Harsant, Cllr Pam Stewart, footpath, Gladstone Road, Ipswich Borough Council, Sir Humphrey | Permalink. I was advised yesterday that Ipswich Borough Council engineers were conducting a survey at the footpath site. The survey is called a “level survey” and is something to do with the drainage that would need to be built when the path is eventually paved. My source was good as, in typical public sector style, I saw two orange-fluorescent attired men and what looked like a student placement young man get back into their Borough Council pool car yesterday lunchtime. How many engineers does it take to measure the levels of a dirt track came to mind? Let’s hope they can now get the design for the path completed – how difficult can it be to design the laying of concrete slabs? Categories: Foxhall Road, Gladstone Road, Ipswich Borough Council, path, Sir Humphrey | Permalink. On Sunday I blogged that the third consultation period for the path expired on 29th June and, as Holywells Councillor Liz Harsant told me, there were no objections by residents. Newly elected Holywells Councillor Pam Stewart contacted the officer in charge of the footpath creation scheme for an update. Now that the date of 29/06 has come and gone, I have requested that the final design for the footpath be undertaken as a matter of urgency to enable programming by Highway Services team for construction. So we still have no clear date when the works, approved by elected representatives from all political parties at my Committee in August 2009, will take place. This is becoming a bit of a joke. This dirt track was approved for paving by elected representatives of the appropriate Ipswich Borough Council committee, was approved by all 48 elected representatives of the Full Council, was legally cleared for progression on 18th May this year and has completed three consultation periods and still we have no idea when the first paving slab will be laid. The contempt for democracy by officers at Ipswich Borough Council is quite disgraceful. I wonder if the path was in Gipping Ward or Gainsborugh Ward we would have had such foot-dragging behaviour from the mandarins at Grafton House. Categories: Cllr Liz Harsant, Cllr Pam Stewart, Gladstone Road, Ipswich Borough Council, path, Sir Humphrey | Permalink. 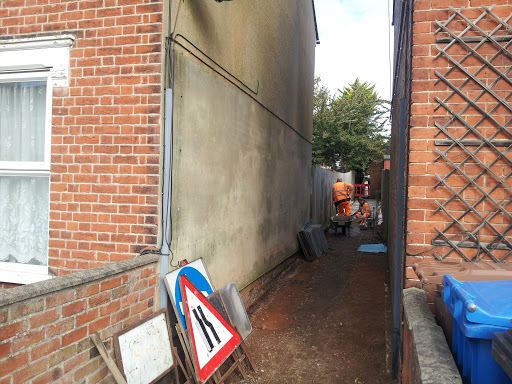 As you know from the last time I wrote about this, the issue of the still unpaved pathway between Gladstone Road and Foxhall Road is my pet project on this blog. Unsurprisingly, the dirt track is still not paved. The latest and third consultation period, after the footpath creation order was published in May, ended last Friday 29th June. I spoke with my ward councillor, Liz Harsant, yesterday who advised “there were no objections” to the footpath being created. 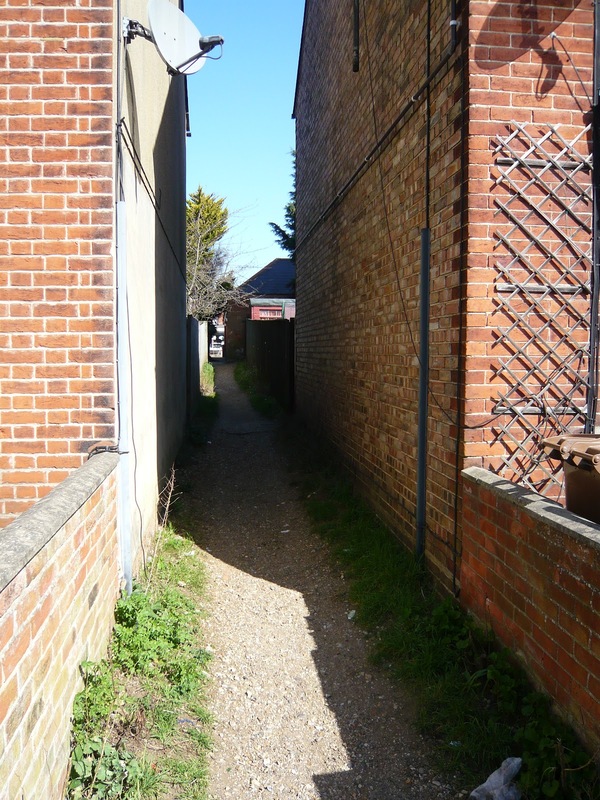 Shock, horror – you mean local residents want a well-used passageway paved rather than have to tackle the dirt and the weeds every time we go and get a pint (sorry litre!) of milk from the Co-op. According to the email sent to Holywells Conservative Councillor Liz Harsant by the Borough Council’s community improvements officer John Clements back in May, as there have been no objections, the Council should now be getting on with planning the paving work. I have today written to Cllr Liz Harsant and newly elected Holywells Conservative Councillor Pam Stewart asking for an update on when the paving works will begin. Cllr Stewart is aware of the Council’s intransigence on this issue and she asked Labour’s transport chief a question about it at the Full Council meeting in March. As soon as I hear any more news from my councillors, I shall let you know. Next month, it will be three years since my Committee approved funding for the footpath. During this time, my wife has completed a degree, we got married and also had our first wedding anniversary. I do hope the path is paved before our second wedding anniversary next year! The saga continues. As I reported back in March, Ipswich Borough Council finally got round to publishing the Order to create a paved footpath for the entire alleyway between Gladstone Road and Foxhall Road. The deadline for objections was 19th April. Or so we thought. “The legal process required to enable work to be undertaken to surface the alley way in question is underway. The legal advertisement of the desire of the Council to create a footpath was undertaken in April. The consultation period for this has now closed. The order of confirmation now needs to be circulated to residents who have access rights over the land and copies placed on-site. 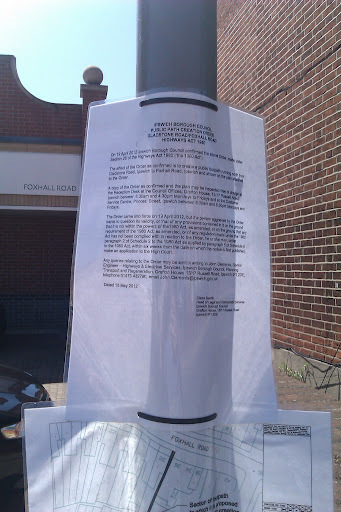 There is a further 6 week period where anyone can question the validity of the order and for residents to claim compensation for depreciation or damage for disturbance associated with making the footpath a public right of way. Oh terrific. So after three years since I approved the footpath scheme at my Committee, after the scheme was approved at the Executive committee and after all 48 councillors on Ipswich Borough Council approved the scheme, Sir Humphrey is still stopping the first slab from being laid. The only reason the Order was even advertised in March is because a) Cllr Harsant and myself put pressure on the civil servants at the Borough in writing and in person at a public meeting, and b) because newly elected Councillor Pam Stewart (when she was the Conservative candidate for Holywells ward) also asked Labour’s transport chief Phil Smart what the hold-up was at the Full Council meeting in March. When Douglas Carswell complains the bureaucrats are really running the Coalition Government, they are obviously learning the dark arts of obfuscation and intransigence from the civil servants in Ipswich. Categories: Cllr Liz Harsant, Cllr Pam Stewart, Gladstone Road, Ipswich Borough Council, Sir Humphrey | Permalink. The deadline for Ipswich Borough Council to receive objections to the paving over of the dirt track which runs between Gladstone Road and Foxhall Road in Holywells Ward expired yesterday. I now wait with bated breath for Cllr Phil Smart to confirm if any objections were received to turn an overgrown gravel track into a clean paved footpath for the benefit of residents and visitors to the area alike. According to Mark Wedgwood, the officer at the Council in charge of the footpath creation scheme, we are now at the below stage in the process, which was approved by my Committee almost three years ago! On the assumption that we do not receive any objections, the footpath creation order will come into full operation on 19 April. Works can then be programmed. I hope we can see the first paving slab being laid soon or do we need to trouble Justine Greening?? Categories: Cllr Phil Smart, Gladstone Road, Holywells ward, Mark Wedgwood, path, Sir Humphrey | Permalink.